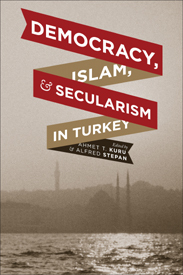 From Columbia University Press, a new collection of essays on law and religion in Turkey, Democracy, Islam, and Secularism in Turkey, edited by Ahmet Kuru (San Diego State) and Alfred Stepan (Columbia). The publisher’s description follows. While Turkey has grown as a world power, promoting the image of a progressive and stable nation, several choices in policy have strained its relationship with the East and the West. Providing historical, social, and religious context for this behavior, the essays in Democracy, Islam, and Secularism in Turkey examine issues relevant to Turkish debates and global concerns, from the state’s position on religion to its involvement with the European Union. Written by experts in a range of disciplines, the chapters explore the toleration of diversity during the Ottoman Empire’s classical period; the erosion of ethno-religious heterogeneity in modern, pre-democratic times; Kemalism and its role in modernization and nation building; the changing political strategies of the military; and the effect of possible EU membership on domestic reforms. The essays also offer a cross-Continental comparison of “multiple secularisms,” as well as political parties, considering especially Turkey’s Justice and Development Party in relation to Europe’s Christian Democratic parties. Contributors tackle critical research questions, such as the legacy of the Ottoman Empire’s ethno-religious plurality and the way in which Turkey’s assertive secularism can be softened to allow greater space for religious actors. They address the military’s “guardian” role in Turkey’s secularism, the implications of recent constitutional amendments for democratization, and the consequences and benefits of Islamic activism’s presence within a democratic system. No other collection confronts Turkey’s contemporary evolution so vividly and thoroughly or offers such expert analysis of its crucial social and political systems.